"It's good we didn't shoot ourselves in the foot by losing the game," said WBA boss Roy Hodgson. "We almost paid a high price after taking a sensible lead and then committing hara-kiri by giving the goals back. "All credit to Cardiff they pressured us well, they didn't make it easy for us at any stage. "But luckily we were able to get the third goal which put us on the front foot again, and after that we had a lot of chances to add to that, but we only scored once." 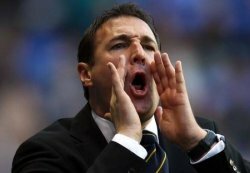 Cardiff boss Malky Mackay admitted to being 'very proud' of his team given the number of changes he made. "We managed to get back into the game and looked as if we were on the front foot, but it was a magnificent strike from Cox to take the win," he said. "We ran a Premier League side very close. At 2-2 I looked across at the opposition dugout and their manager was looking quite animated, so we were certainly doing something right. "Now we can turn our attention to the game at Selhurst Park (a Carling Cup semi-final first leg against Crystal Palace on Tuesday)."